The final observations of the Frontier Fields project are now in the books, although the hard work of analyzing the data has just begun. Views of the stunningly beautiful galaxy cluster Abell 370 and its parallel field mark the end of this ambitious observing campaign, which began in October 2013. The photogenic Abell 370 contains an astounding assortment of several hundred galaxies tied together by the mutual pull of gravity. Located approximately 4 billion light-years away in the constellation Cetus, the Sea Monster, this immense cluster is a rich mix of a variety of galaxy shapes. The brightest and largest galaxies in the cluster are the yellow-white, massive, elliptical galaxies containing many hundreds of billions of stars each. Spiral galaxies — like our Milky Way —include younger populations of stars and are bluish. Entangled among the galaxies are mysterious-looking arcs of blue light. These are actually distorted images of distant galaxies behind the cluster. Many of these far-flung galaxies are too faint for Hubble to see directly. 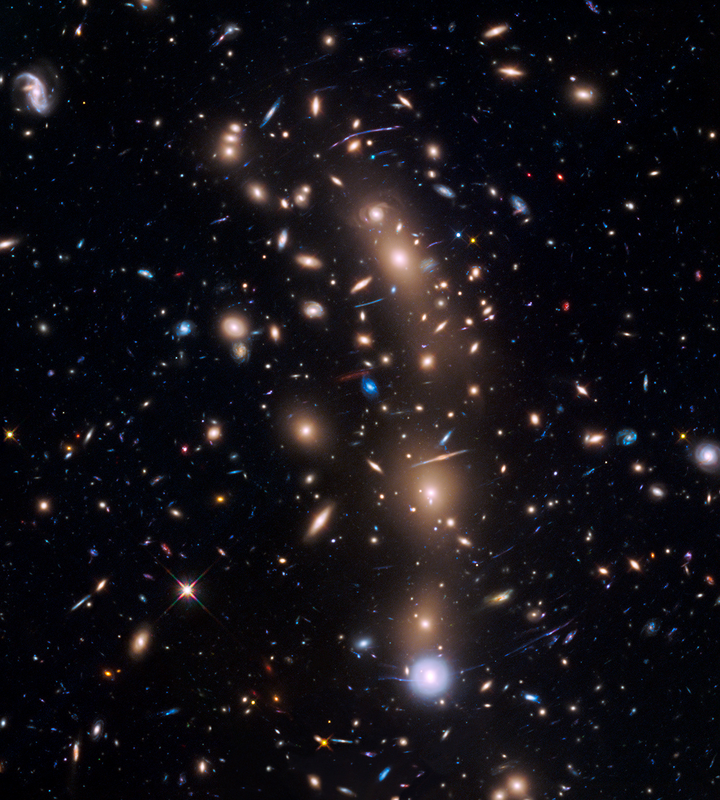 Instead, in a dramatic example of “gravitational lensing,” the cluster functions as a natural telescope, warping space and affecting light traveling through the cluster toward Earth. Like a funhouse mirror, Abell 370 magnifies and stretches images of the background galaxies. The most stunning example of this lensing effect in Abell 370 is “the Dragon,” an extended feature that is probably several duplicated images of a single background spiral galaxy stretched along an arc. Long before the powerful Hubble Space Telescope could see such things, Albert Einstein in 1912 predicted that the gravity of massive objects could bend light to create this type of optical illusion. 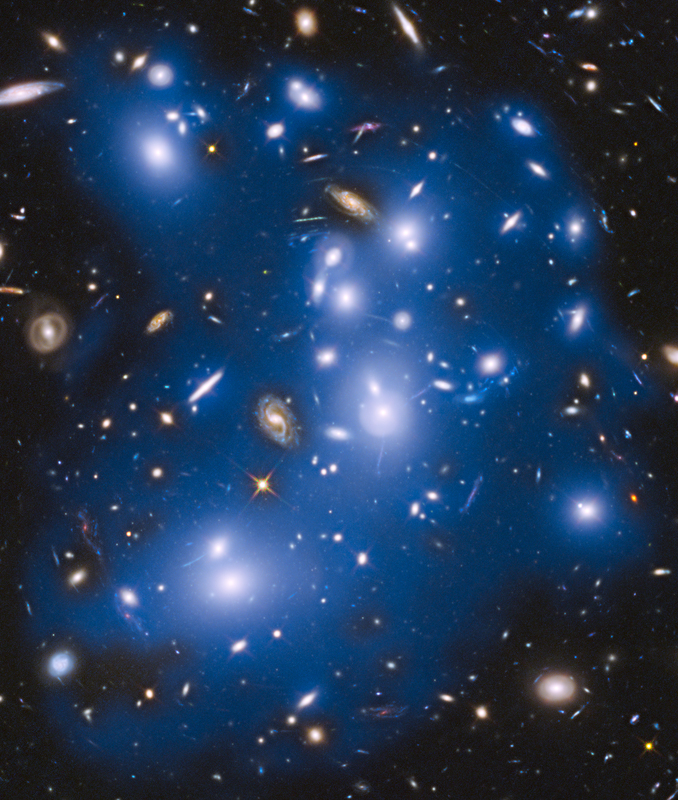 In 1937, astronomer Fritz Zwicky suggested that this effect would offer astronomers a chance to see lensed background galaxies behind galaxy clusters. 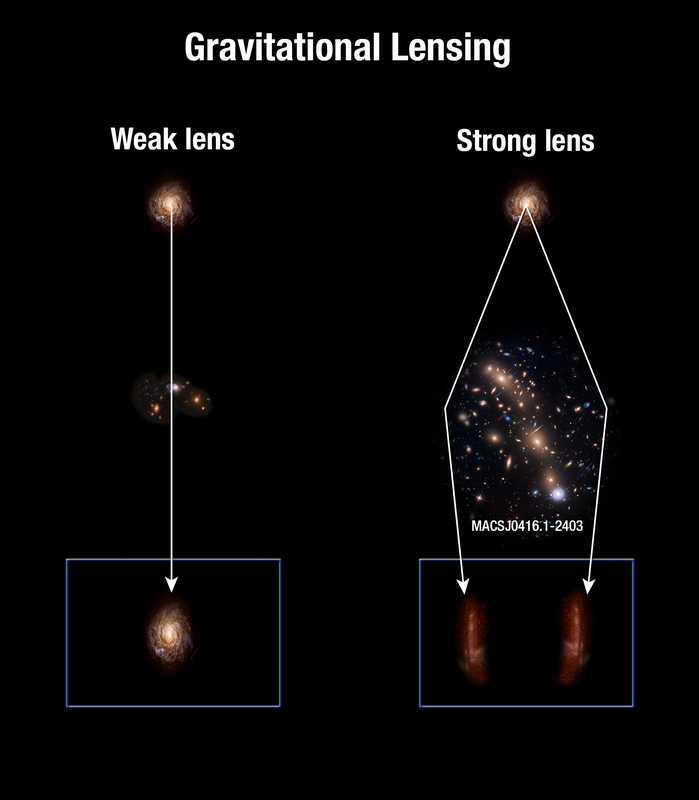 Gravitational lensing magnifies background galaxies that are otherwise presently unobservable. Abell 370 was one of the first clusters in which astronomers observed the phenomenon, and “the Dragon” was, in 1988, the first galaxy to be confidently identified as gravitationally lensed. 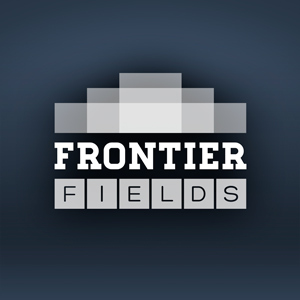 So, it seems only fitting that Frontier Fields should end on the cluster that began this new field of research. 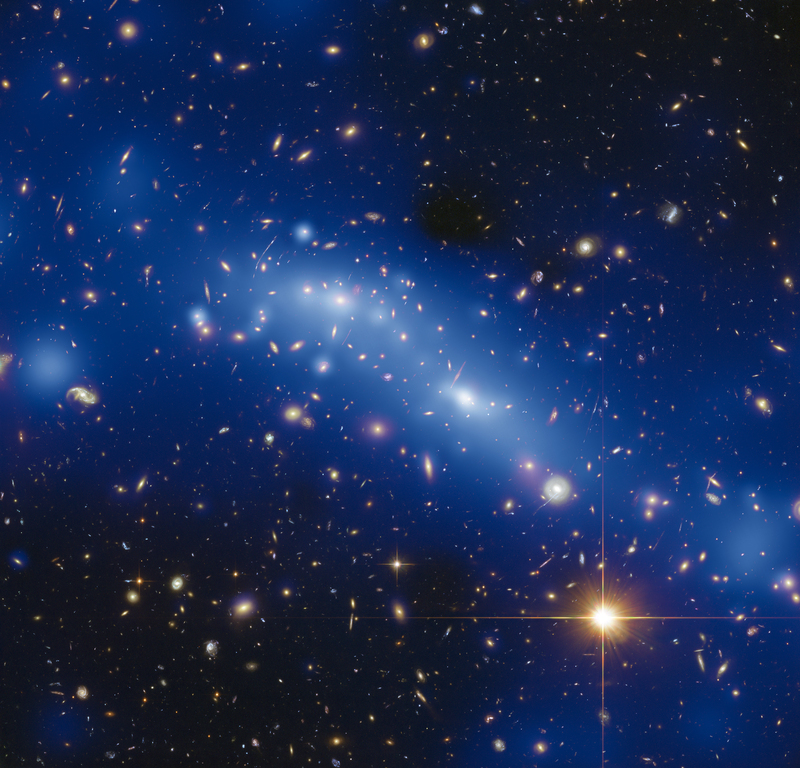 While one of Hubble Space Telescope’s cameras looked at the galaxy cluster, another camera simultaneously viewed an adjacent, seemingly sparse patch of sky. This second region is called a “parallel field”—a portion of sky that provides a deep look into the early universe. Hubble used the Advanced Camera for Surveys (ACS) for visible-light imaging, and Wide Field Camera 3 (WFC3) for its infrared vision. Six months later, the cameras effectively swapped places, with each camera now observing the other’s previous location. 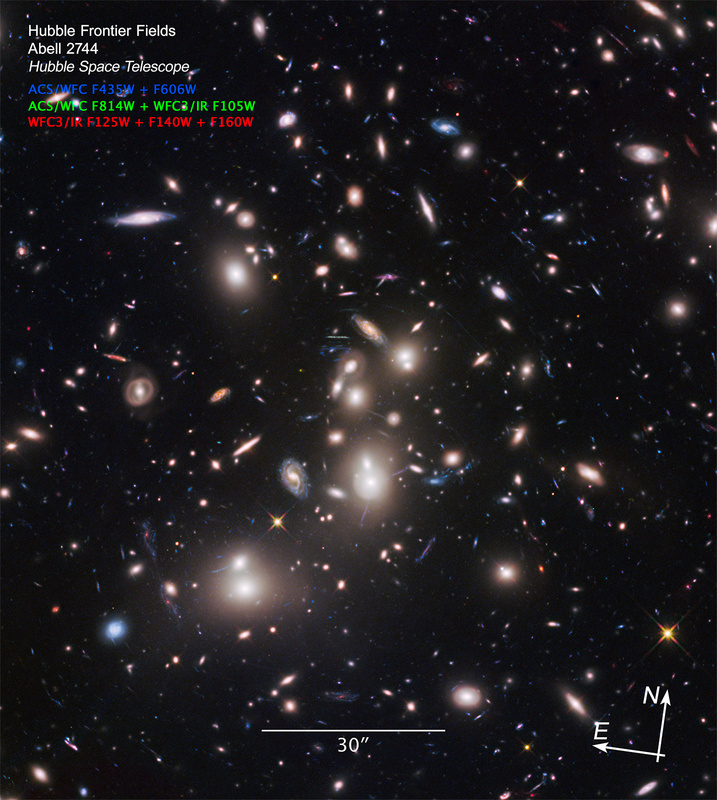 The locations of Hubble’s observations of the Abell 370 galaxy cluster (right) and the adjacent parallel field (left) are plotted over a Digitized Sky Survey (DSS) image. The blue boxes outline the regions of Hubble’s visible-light observations, and the red boxes indicate areas of Hubble’s infrared-light observations. A scale bar in the lower left corner of the image indicates the size of the image on the sky. The scale bar corresponds to about 1/30th the apparent width of the full moon as seen from Earth. Astronomers refer to this unit of measurement as one arcminute, denoted as 1′. 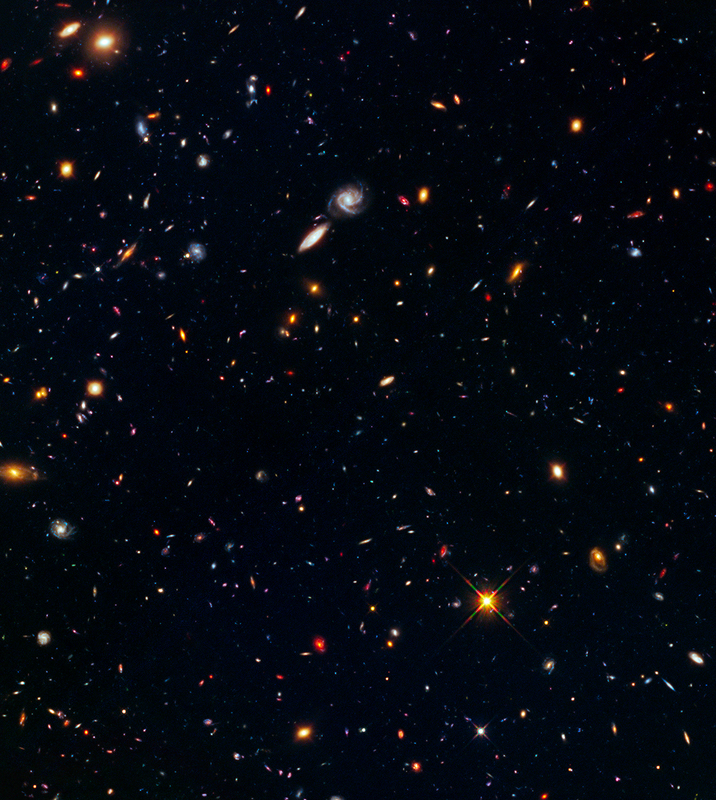 The image of the parallel field is a typical view of the universe at large — a sea of galaxies that span space and time. Reminiscent of the iconic Hubble Deep Field, it offers a wide assortment of majestic star cities that that vary in age, shape, and stellar populations. It’s a narrow view down a corridor that stretches back in time for billions of years. The wide range of rich colors come from the fact that this snapshot is assembled from images taken in visible light as well as near-infrared light. The small, reddest objects are presumably the farthest galaxies, whose light has been stretched into the red part of the spectrum by the expansion of space. The yellow objects are massive football-shaped elliptical galaxies that contain older stellar populations. The blue galaxies are disk-shaped pinwheels of ongoing star formation. The entire field is peppered with much smaller, irregularly shaped, fragmentary blue galaxies – the ancestors and “building blocks” of majestic spiral galaxies like our Milky Way. These images, along with the 10 previous Frontier Fields, provide a treasure trove of data that astronomers will be analyzing for years to come. Hubble has captured an image of the first-ever predicted supernova explosion. 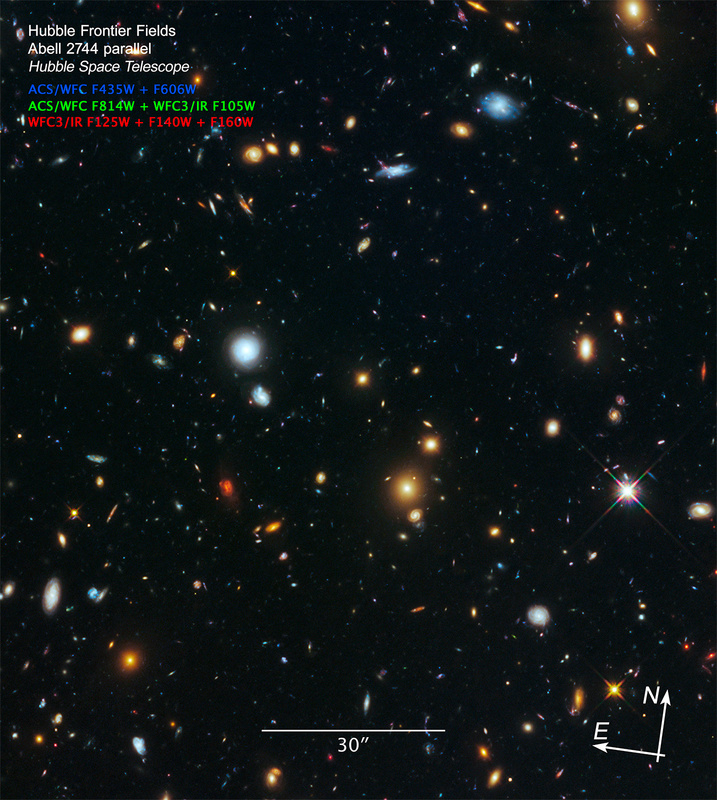 In November 2014, Hubble’s Frontier Fields program caught sight of a supernova called “Refsdal” while examining the MACS J1149.5+2223 galaxy cluster. Astronomers spotted four separate images of the supernova in a rare arrangement known as an “Einstein Cross” around a galaxy within the cluster. Seeing such distant, gravitationally lensed objects is, of course, the point of the Frontier Fields project, but this one had a special quirk. By studying different models of just how mass is positioned in the galaxy cluster, astronomers could predict one more light path for Refsdal, one that would delay the light reaching the telescope until late 2015 or early 2016. This means they could predict when and where in the field the image of the supernova would appear next. Astronomers began taking snapshots of the predicted area over an expected time period. And sure enough, on Dec. 11, 2015, the astronomers captured the reappearance of the supernova where they had anticipated it would be. The detection of this fifth appearance of the Refsdal supernova served as a unique opportunity for astronomers to test their models of how mass — especially that of mysterious dark matter — is distributed within this galaxy cluster, and they seem to be right on track. These images show the search for the supernova, nicknamed Refsdal, using NASA’s Hubble Space Telescope. 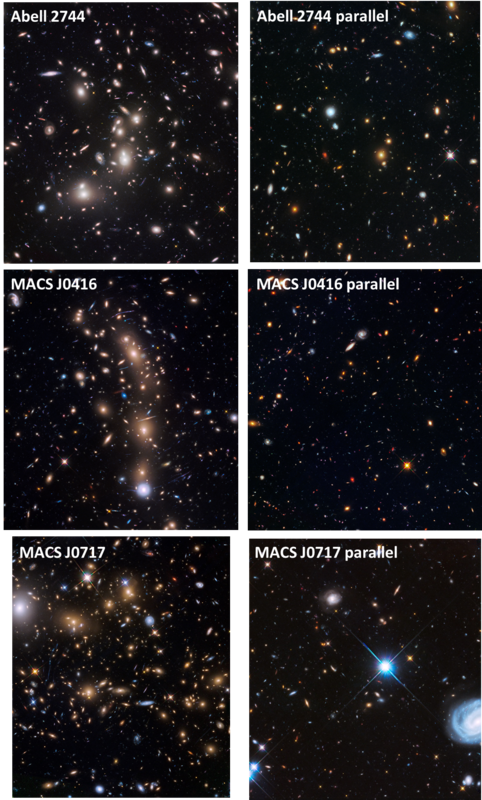 The image on the left is the galaxy cluster MACS J1149.5+2223 from the Frontier Fields program. The circle indicates the empty but predicted position of the newest appearance of the supernova. The image at top right shows observations taken by Hubble on Oct. 30, 2015, at the beginning of the observation program to detect the newest appearance of the supernova. The image on the lower right shows the discovery of the Refsdal supernova on Dec. 11, 2015, as predicted by several different models.